Manager Mark Burchill says he expected Livingston to take something from their game against Rangers. Burchill's men produced a battling performance to frustrate the Championship leaders, coming from a goal down to earn a point. Now Burchill wants Livingston to turn performances into results to lift them up the table. 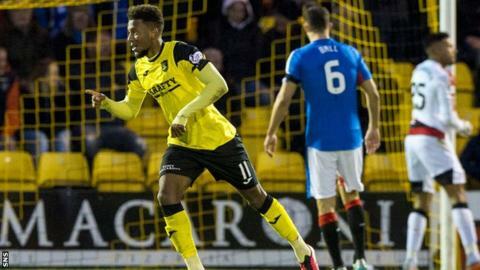 "I think we were definitely deserving of a point," he told BBC Scotland following the 1-1 draw. "The guys played very, very well. We didn't allow them to have too many opportunities at goal and what they did have, we put a lot of pressure on the ball. "Tactically the players were fantastic, that was the big thing. We've been playing really well against the big teams and I said during the week we're going to get points off them. "I expected to get something and I'm disappointed at the end because I thought we could have nicked it - we might have had a penalty and we nearly got in at the back post, but I'm sure Rangers will think they should have won it as well." The point puts Livingston on 11 for the season. They sit seventh, above St Mirren and Dumbarton on goal difference, but Burchill sees the result as evidence they should be higher. "What you've seen is we're a very good side," he said. "We shouldn't be where we are. We've been really unlucky at times but we're starting to build something. "The players are listening and learning and getting better all the time. You've got to remember there were eight new players from last season in the starting eleven today, so we're getting there. "I firmly believe we're a mid-table team at worst and that's where we're going to end up." Rangers manager Mark Warburton rued a lack of sufficient quality in his side's play but dismissed the suggestion that the closing of the gap at the top of the Championship, with Hibs beating Alloa to go level on 37 points, represented a test of his players' mettle. "There's no doubts about the players' mettle or their quality, commitment or desire," Warburton told BBC Scotland. "Other teams have had very good runs - all credit to them. We haven't done a lot wrong. "I think we lacked a bit of quality. We had lots of possession, we got the goal, started the game really well, showed good quality in the first half and should have got the second. "But second half, they got an early goal and we got sloppy, a little bit loose in possession. We created chances, but not enough clear-cut chances, not enough quality in that key area of the pitch. "We spoke weeks ago about teams putting eight, nine, ten men behind the ball and we'll be camped in their half but we have to show that quality. We have many, many times. "There's no doubt about the quality in that dressing room. The players are frustrated because they worked hard, dominated a lot of the football but didn't really test the keeper enough."